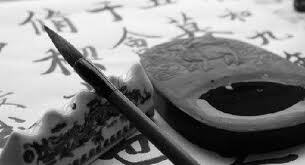 I sit down and arrange a few things before me – paper, ink, inkstone, brush and zi tie, which literally means “word obedience” or “word submission” but can be translated into “word copybook.” (The zi tie is a printed copy of an original work of calligraphy, usually done by a master. This copybook serves as the model for calligraphers.) I pour a bit of ink into the well of the inkstone. I then take the brush, which is made of wolf hair or goat hair, dip it into the ink which I have poured into the well of the stone and gently wipe it across the surface of the stone to get rid of any excess ink. I gather myself. Before the attack, I relax, concentrate, breathe. My goal is is to copy the characters I see on the zi tie as best as I can. I use one zi tie religiously, which was recommended to me by my father. He said, if you can learn to copy these characters well, then you can write any calligraphy well. “Write” is not quite the right word, I think. Perhaps “draw” is more appropriate. You are, after all, using a brush to draw each stroke of each character. At any rate, I realize that with every stroke of the brush, I am making an attack. I need to concentrate in order for the brush to obey my will and do what I want it to do. Once you make a stroke, you cannot modify it or take it back. You have only one chance. When the stroke appears on paper, it is what it is. The first thing I’m aware of when I’m writing calligraphy is whether my stroke is balanced or not. Every character in Chinese requires balance. In fact, a single unbalanced stroke can make an entire character look unstable, as if it would fall easily if you were to push it gently with your hand. Each character should stand upright so that it has poise. The second thing I’m aware of is knowing that certain strokes aren’t as good as I’d like or even complete failures, but I can’t paint over them. I can’t change them, so I keep going. Even if I’m disappointed, I finish the rest of the character as dutifully as I can, and I try to keep in mind that each new stroke is another chance at doing well. When this happens, I realize that practicing Chinese calligraphy is a metaphor. Accept what happened, move on and try again. I keep dipping the brush in the ink and wiping the excess ink away on the stone and copying the characters until I have a full page of characters in front of me. That’s when I realize something else. For the whole time that I was practicing this art, I forgot everything else – all my worries, my troubles, unfinished chores or what I needed to do later. I was completely absorbed in a simple act of copying characters. The written Chinese language is so poetic. When I write in general, I feel alive. But when I write Chinese, I feel it even more keenly because when you write in Chinese, you need to pay attention to how you construct every word. If you miss a dot or a line is too long or too short, it can change the character into a completely different one. Writing Chinese requires you to remain aware and stay balanced. Chinese characters are pictorial in origin. It is the only major modern language which remains so and has no alphabet. Therefore, each character is known by memory. However, many characters actually make sense in their separate parts. For example, if you place the character for “woman” under the radical for “roof,” you arrive at the word that means “safe,” i.e. a woman under a roof is “safe.” Now, if you were to write this character, and you put the roof too high above the woman or the roof is crooked, it might not look or feel “safe.” You need to write the strokes so that they look and feel like they go together. In other words, you achieve a sense of harmony. When I practice calligraphy, something magical happens. I don’t know how to explain it exactly. But it is a sense of peace and of being alive that infuses me and travels through my brush. If you practice every day, you start to notice something else about your characters. They start to gain strength. Not just balance, but real strength. Now that you are better at taming your brush, you can channel your energy so that the soft tip of hair becomes like a sword and can carve sharp lines into the paper. It is said that a great master can literally carve characters with his brush into a wood table. I think this is an exaggeration, but it also contains some truth. Calligraphy is, in fact, a type of kung fu. It uses the same principles. Energy is channeled in the same way so that with practice and concentration, you can achieve balance, flexibility, focus, awareness, a sense of harmony and strength through simple actions. But more importantly, writing calligraphy helps me realize that what’s important is now. It is this stroke before me that I want to make and am making. You can’t think of your last stroke with pride or disappointment if you want to do well because you have to concentrate on this single moment. So focus. In the end, for the half hour or hour that I sat down to produce a sheet of copied characters, I feel calm. I feel like I disposed of a lot of garbage in my head. I remember something my father said when I first tried writing Chinese calligraphy when I was young. I said the character for “one” which has only one stroke, looked easy to write. He replied somewhat mockingly, “It’s the easiest that is the hardest.” I think I understand now what he meant. Your characters express what is going on with your body, your imagination, your character and the discipline you have gained. It is entirely visible to the world in that one, single stroke. You can’t balance it out with another stroke or dot. It is naked in the moment in time that you created it. It takes courage to write the character “one.” I’m still working on it. 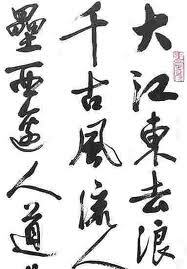 This entry was posted in Art, Chinese calligraphy, Language and tagged Chinese characters, ink brush, inkstone, martial arts, meditation, writing Chinese by wodezitie. Bookmark the permalink. So the closer your characters imitate the zi tie the better they are? It’s just about exactness? Hi Arnold, I sincerely apologize for my late response… Thank you so much for your question. I asked the same question before. My father said, It is very important to copy the zi tie as closely as possible. The reason is because you learn the technique of every brush stroke. You learn patience and discipline. You gain strength in your characters. Once you have “mastered” a certain zi tie, then you can learn to copy others and eventually come up with your own style of writing. It is not that different from other arts, where practice means copying and learning from the best until you come onto your own. When you do, you then have the ability to write freely in whatever style you feel inspired by. To me, above all, writing calligraphy is about concentration and being aware in that moment. I learn to be still and appreciate my body, my breathing, my sense of balance and wipe away my fears and my doubts to simply apply brush to paper. It is wonderful!